We know the Percale is the best seller, but the Sateen gives it a run for the money. Flannel is great, but not for warmer climates. But in the middle of the winter you will wish you had Flannel.So,if you want a nice set of Made in the USA 100% organic cotton sheets, look no further. We have found this USA manufacturer of these sheets in 2014 and have not looked back. Sets come with 2 pillowcases and come in a nice tote bag. Leora the owner of The Organic Mattress Store swears by these organic sheets. And again the best part is they’re Made in the USA. This USA company manufactures a host of woven fabrics to meet our customer’s needs. They have produced Certified Organic Cotton fabrics for our USA Customers for many years, and everybody loves them. We are proud to provide to our customers 100% certified organic sheets that are Grown and Made in the U.S.A. With so many products coming from overseas it helps to think we are doing a small part in keeping jobs in the USA. 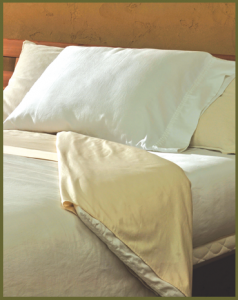 Help us support the USA with your purchase of these organic cotton sheets.